Important instructions for the use of EDN carbide-tipped circular saw blades. 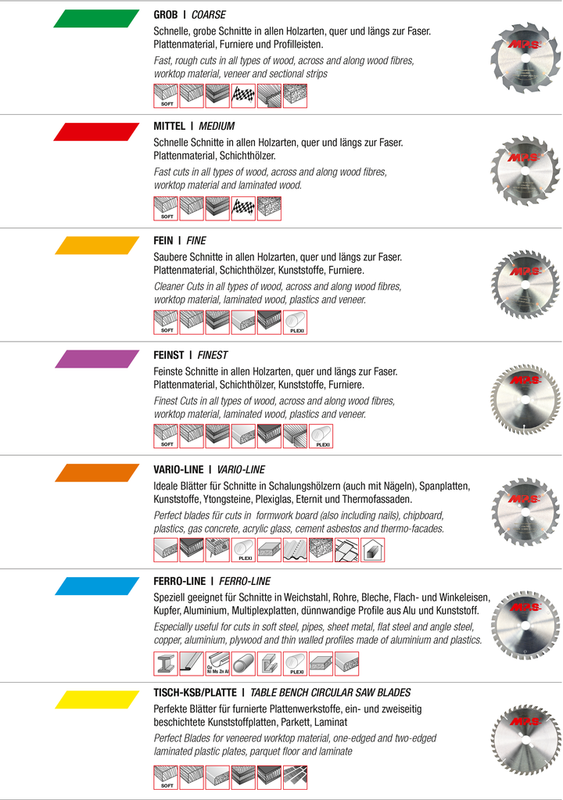 Please note the following when using EDN carbide-tipped circular saw blades. The machine spindle must run free from clearance and vibration. The wobble of the flanges must not exceed 0.02 mm and the circular twist of the spindle 0.03 mm. The largest possible flange diameter should be chosen, since large flanges prevent the saw blade from chattering, particularly in the case of very thin blades. If possible, the flanges should not be smaller than 1/3 of the saw blade diameter. The flanges must always be cleaned before use. Before changing the motor speed, it is essential to check that the saw blade is free running. Make sure that the workpiece is correctly guided and that the workpiece support is at the correct angle to the saw spindle. Impurities in the material (veneer staples), metal- and stone fragments can cause the carbide tips to break out. 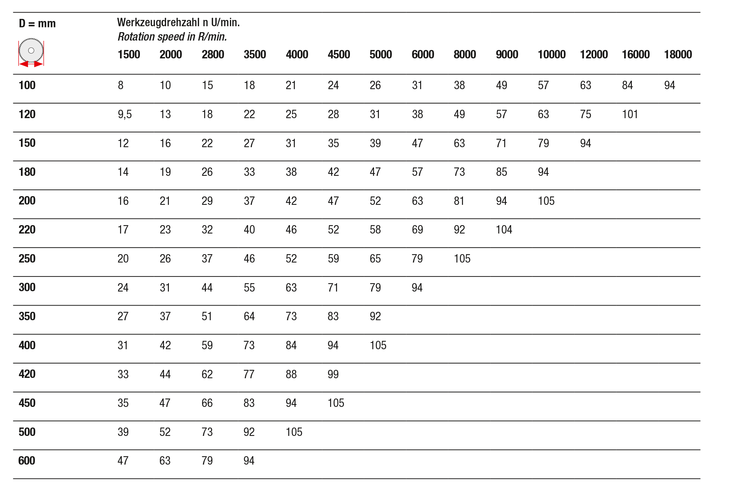 The cutting speed (circumferential velocity) depends on the speed (rpm) and the tool diameter. The values are shown in m/sec. in the table below. The feed should not be less than 1/1000th of the tool speed. For example, at 6000 rpm the feed should be 6 m per minute. Warning, the maximum speed indicated on the circular saw blades must not be exceeded! Exceedance of this maximum permissible value will have impact on the quality of the saw blade. Cutting qualtiy and expected useful life will be affected. Furthermore, danger can impend in form of physical injury!